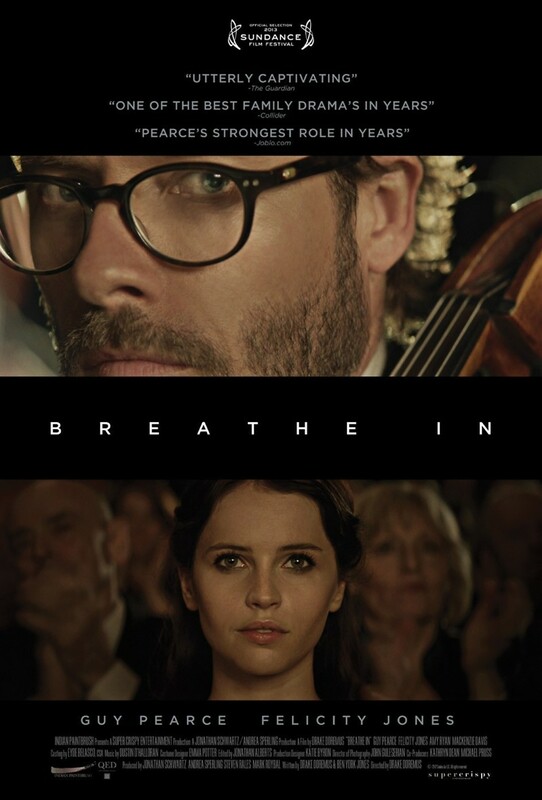 Breathe In DVD and Blu-ray release date was set for August 12, 2014. Keith Reynolds is a university teacher who agrees to host a talented music exchange student while she enters the U. S. to pursue a music career. Sophie Williams, the foreign exchange student, arrives from the United Kingdom to live with his family. The two become closer when she sees that he is feeling trapped by his life and his seemingly perfect family. Every moment between them is fraught with sexual tension, but it is so much more than that. She makes him re-evaluate his life, and see it in a different light. She reawakens a passion in him. He struggles against the boundaries in his life along with his desires both for Sophie and to not hurt his family. The family ends up altered forever by the simple act of inviting an exchange student into their home.